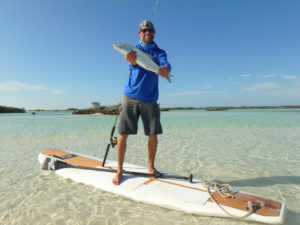 Cruise through the waters of the South Florida on board our boat Grims Revenge for a 5,7 & 9-hour deep sea charter fishing, sword fishing, paddle boarding, cruises with Pokemon gamers in mind, or a get-away on an exclusive island fishing charter trip. 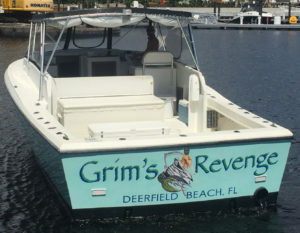 On board the Grims Revenge is a great period for you to test your fishing skills and boating abilities. Goddess Charters is a great choice for your sports fishing adventure. After 20+ years, we know these local waters like the back of our hand. We know where the top fishing locations are and, above everything else, we know how to create a great time for our clients. Goddess Charters is happy to serve everyone looking for adventure and a fun time on the sea: novice or experienced sports fishermen, families, businessmen on a team building trip, etc. Don’t worry if you are inexperienced – we are here to teach and guide you and will do everything necessary to ensure you have a fun and pleasurable experience during your deep sea fishing adventure. Just come aboard and have a great experience! Family fishing trips are one of our favorite charters. We love for our young travelers to experience deep sea fishing for the first time – because once experienced, this is a love for life! Deep sea fishing teaches us invaluable life lessons: patience, endurance, persistence, love of nature, the satisfaction of success and how to handle a loss. These are just some of the important life lessons we teach our young clients – lessons that are well-learned and used throughout life. We enjoy creating life-long memories with your family! We provide a 5,7 & 9 hour deep sea charter fishing trips for you and your group of fellow fishermen. Deep ocean waters and the Gulf Stream is less than a 30 minute ride from our docks, so you will quickly be able to fully immerse yourself in a pleasurable deep sea fishing experience. Our fishing charter has been custom designed to accommodate all different fishing charters, including corporate deep sea fishing. There is nothing better for team building than deep sea fishing, for the same reasons we have already mentioned in the family deep sea fishing. Team building is tested and developed in demanding deep sea fishing conditions – experience team effort being rewarded, test your team’s endurance and unity, and enjoy the end result. In the end, every team member can enjoy well-deserved relaxation on the deck. Our charter crew has taken team building groups on deep sea fishing trips for over two decades; we are well-equipped and perfectly trained to give your team the best sport fishing experience ever! The Bahamas are the cultural and tourist capital of the Caribbean Islands. Tourists from all over the world come here to enjoy the hospitality of the locals and the natural beauty of the islands. However, on our charter trip you will get a unique opportunity to reach more isolated islands and the natural pearls of the archipelagos where your dream can become a reality. You will have a chance to relax on a secluded sandy beach by the sea in the most beautiful shades of blue and turquoise, watching colorful coral reefs and tropical fish. The Bahamas are islands where you can return numerous times and always discover interesting locations, secluded beaches and new exploring destinations.